Plastic green houses | TUBUS Rýmařov, s.r.o. Within the building of complete forest tree container nurseries, we realise building of foil coverings. When growing the containerized plants, the foil coverings serve for precultivation of plants from sowing up to the moment, when the plants are taken out to hardened outdoor areas for further cultivation. Thanks to automatic ventilation and heating, possible thanks to automatically controlled irrigation, it is possible to create absolutely ideal conditions for the sprouting of seedlings and for first phases of their growth in the foil covering. The plastic greenhouses are assembled in different lengths and widths, on customer’s request. The step of width is one meter, in the range from 6 meters up to 11 meters. 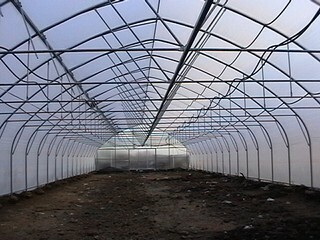 As to length, the plastic greenhouse is built in sections two meters long. All the iron constructional elements are zinc-coated in order to ensure maximal service life. Type of ventilation window can be of various dimensions, again on customer’s request. It ranges from a small one, up to tilting of approx. 1/3 of roof surface for maximal ventilation in summer months or for soon lignification of forest tree species, when the plants are grown in the plastic greenhouse for whole period of the vegetation season. 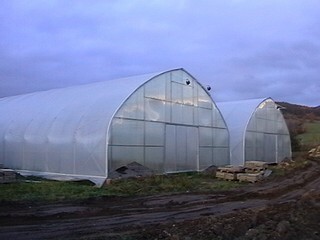 Two foils are stretched on the plastic greenhouse and the air is permanently blown with using of ventilator between them, in this way an air insulating layer originates between the foils. The air layer also tightens the foils, so that they are not damaged even by the strongest wind. Upper layer of the foil is stabilised against UV radiation and service life of the foils is 5 years. 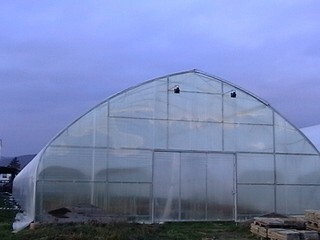 Faces of plastic greenhouses can be made either also of double foil or of polycarbonate. 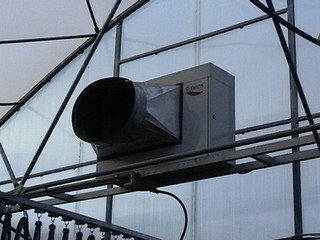 Sliding gate is installed in the face of plastic greenhouses, what prevents heat leakage. Dimensions of the gate can be adapted to customer’s requirements and his means of mechanization. In order to keep stable temperature, the plastic greenhouse can be equipped with a gas hot-air boiler, from which warm air is lead to whole plastic greenhouse through foil sleeves and it runs freely along the wall of the plastic greenhouse towards grown plantations. 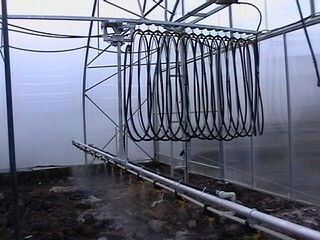 Coordination of ventilation, heating, inflating the double foil on the plastic greenhouse, monitoring of temperature and humidity in the plastic greenhouse in order to achieve stable microclimate conditions in the plastic greenhouse is ensured by the installation of control unit. 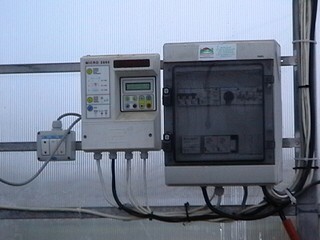 This control unit controls all functions of the plastic greenhouse on the basis of interpretation the values inside (temperature, humidity, time) and also outside (rain, wind intensity) the plastic greenhouse. External values are read by weather station, which is a part of the control unit. If the forest plants are grown in containers located on iron pallets handled by means of mechanization, it is necessary to harden the floor of plastic greenhouse with macadam banking including its compaction and rolling-over.